Warm Start to the Week; (Near-) Record Cold Finish? While all eyes are on the late-week cold shot that Weather5280 team members have been discussing (primarily on Twitter) for the better part of the last week, let’s take a look at the more benign weather expected to start off the week before tackling the late-week cold. Monday offers us a blend of clouds and sun with a slight chance of scattered late day thunderstorms, though I think most areas will remain dry. High temperatures will be near- or even a couple degrees above-normal for the date -- mostly in the mid-80s. If you’re a warm weather person, bask in Monday’s temperatures as it will all be downhill from there. Expect mostly cloud skies with a stray thundershower Monday night, with comparatively mild overnight lows in the upper 50s. Tuesday will start to be a day of transition, as mostly westerly flow aloft is expected ahead of the first push of cold air from the north. Count on more clouds than sun with widely scattered thundershowers; like Monday, most spots are liable to remain dry. It will be cooler, too, with highs probably in the mid-to-upper 70s. The first push of cold air from our aforementioned incoming cold blast will likely come through late Tuesday into early Wednesday for the Denver metro region. This will lead to plenty of cloud cover and a better chance for showers on Wednesday -- especially during the first half of the day -- than either of the two prior days. Models currently have highs in the mid-70s, but I have reason to believe we’ll fall short of this, and probably not escape the 60s for the duration of the day. Let’s put all of our attention now on the cold shot that’s poised to deliver sharply cooler temperatures to the region by late Wednesday into Thursday -- lasting into the first part of the weekend. As long as a week ago, certain models (chiefly the ECMWF) suggested a deep trough of low pressure aloft would form over the western US, allowing unseasonably cold air from Canada to press into much of the western and central US by late week. Several days later, other models followed suit. As of press time, the ECMWF, Canadian GEM, and GFS/CFS have finally started to get into reasonably good agreement regarding this cold spell. 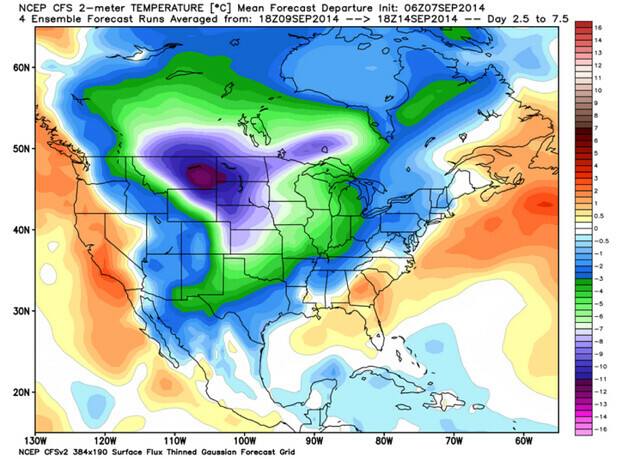 The CFSv2 forecasts the following temperature departures for the 5-day period of Sept 9-14. Note that the values are in degrees Celsius. 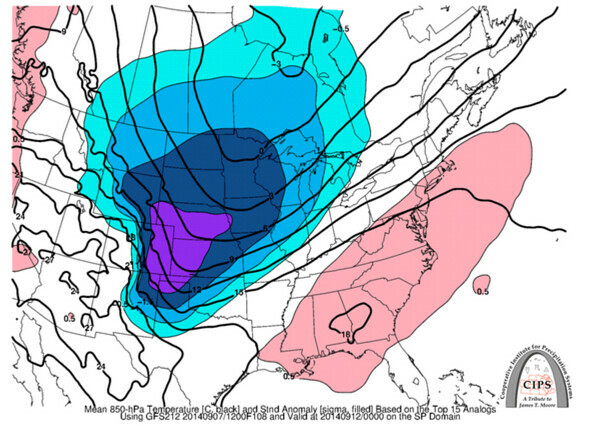 In addition, forecast tools that rely on analogs (or previous patterns that have resembled the one we’re about to enter) suggest that by late Thursday the air on top of us (at 850mb) may be more than 2 standard deviations below normal. Translation into lay-people-speak? Near-record to record cold temperatures are possible by Thursday into Friday as the air aloft is dramatically colder than normal for this time of year. In short, we’ve got a heck of a cold shot on our hands, though the overall pattern aloft will make it quite transient in nature. The coldest period appears to be late Wednesday into early Saturday, with Thursday and Friday easily the coldest two days of the week. While it’s a bit too far out to say with confidence, several models also keep a lot of cloud cover and light precipitation lurking around the region during the day Thursday and Friday; (I’ll come back to this in a moment). This will help to keep temperatures even lower than they might otherwise be (especially during the day time). While models (particularly the hapless GFS) are still trying to get a handle on exactly how cold it will be Thursday and Friday, it appears highly unlikely that temperatures would make it out of the low 50s for highs at this point -- versus average highs for this period near 80 degrees! Should some of the colder model solutions pan out, it is not out of the realm of possibility that Denver metro could be mired in the upper 30s to low 40s for highs either day -- nearly 40 degrees below normal for this time of year. At this point, I cannot rule out the possibility of frost by Friday morning across Denver metro, though cloud cover, among other things, will be the key determinant in just how cold we get. One of the cooler model solutions (GEM) seen below shows air temperatures in the low-to-mid 30s by Friday morning across Denver metro! The exact impacts of this upcoming cold shot on growing things, and the agricultural community in general, probably won’t be clear until about mid-week. 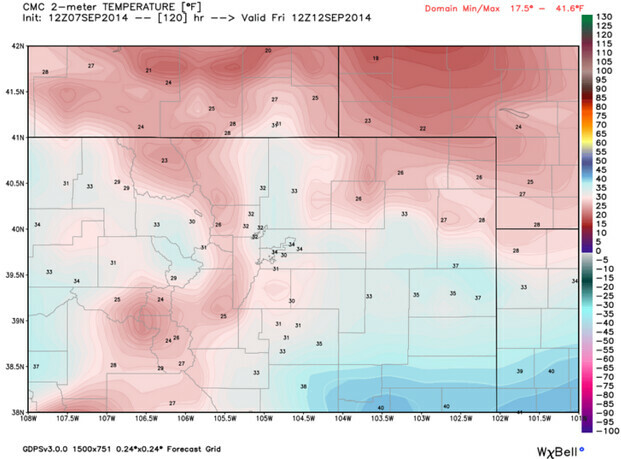 But at this point, given current modeling, I would say there’s probably ~60% chance of frost across parts of the Denver metro area by Friday morning, with a ~30% chance of a light freeze. Remember what I said earlier about some models showing light precipitation lurking around the region both Thursday and Friday? Depending on just how much cold air is in place by late Thursday into Friday, it is not entirely out of the question that some locations could see the first wet snowflakes of the season -- particularly >7000ft in elevation. I am not currently calling for snow in Denver proper, but certain nearby locales may have a shot at some flakes during this time period. 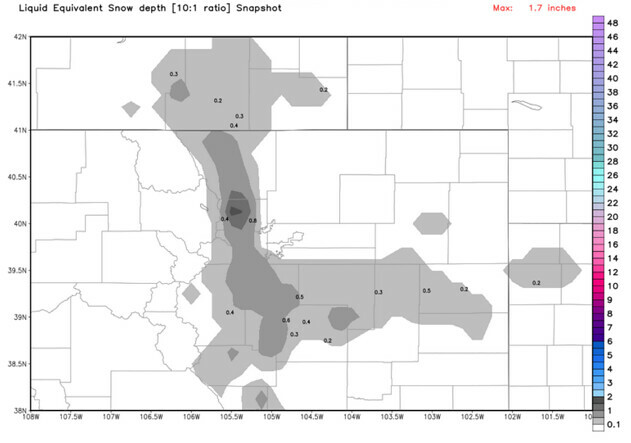 One model brings light snow awfully close to Denver! We’ll obviously have a much better handle on these chances by mid-week. Bottom line: Thursday and Friday each offer the potential for near-record or record cold temperatures particularly during the days, but possibly also at night. For Denver, the record-low maxes for Thursday and Friday -- 41 and 40, respectively -- might be in jeopardy, though I think we’ll probably end up a bit milder than those values. The record overnight lows these two days are 32 Thursday and 31 Friday; again, should some of the coldest current model solutions pan out, those values could also be in jeopardy. For people groaning while reading about the potential for record cold temperatures and perhaps even the season’s first snowflakes for some, particularly at higher elevations, take a deep breath: this cold shot will be very transient in nature; temperatures rebound very quickly by Saturday afternoon -- with highs well into the 60s (if not possibly even the 70s) likely. Sunday appears milder, still, with highs likely well into the 70s.